Home Unlabelled ALEX UNUSUAL OF BIG BROTHER NAIJA STORMS ABUJA TO HOST SHOW LOVE AT TRANSCORP HILTON. ALEX UNUSUAL OF BIG BROTHER NAIJA STORMS ABUJA TO HOST SHOW LOVE AT TRANSCORP HILTON. 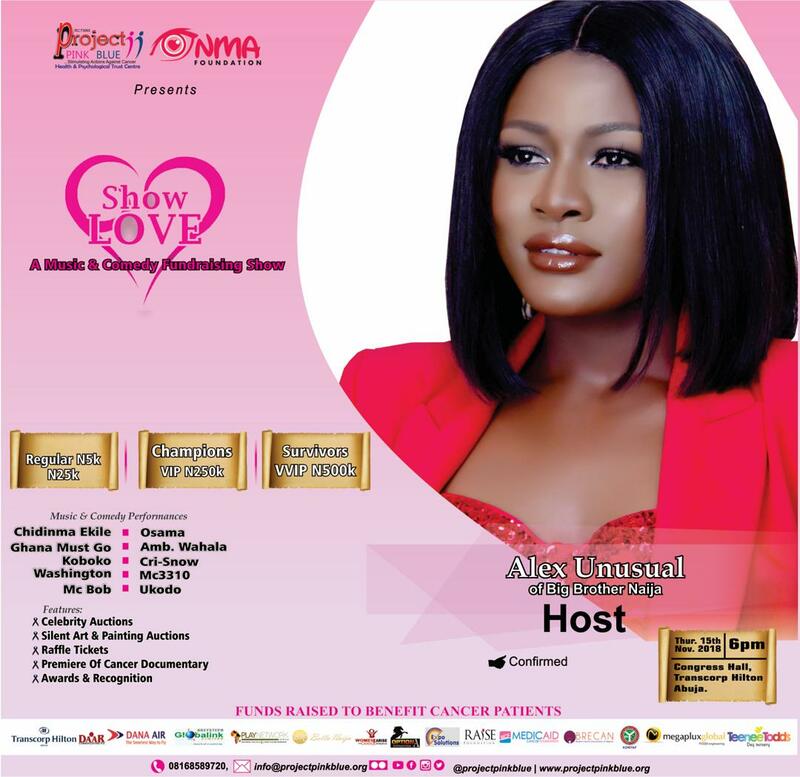 Alex Asogwa popularly known as Alex Unusual of Big Brother Naija will host "Show Love" A Music & Comedy Fundraising Charity event on Thursday 15th November, 2018, 6pm at Congress Hall, Transcorp Hilton Abuja. Abuja- Thursday, November 1, 2018. 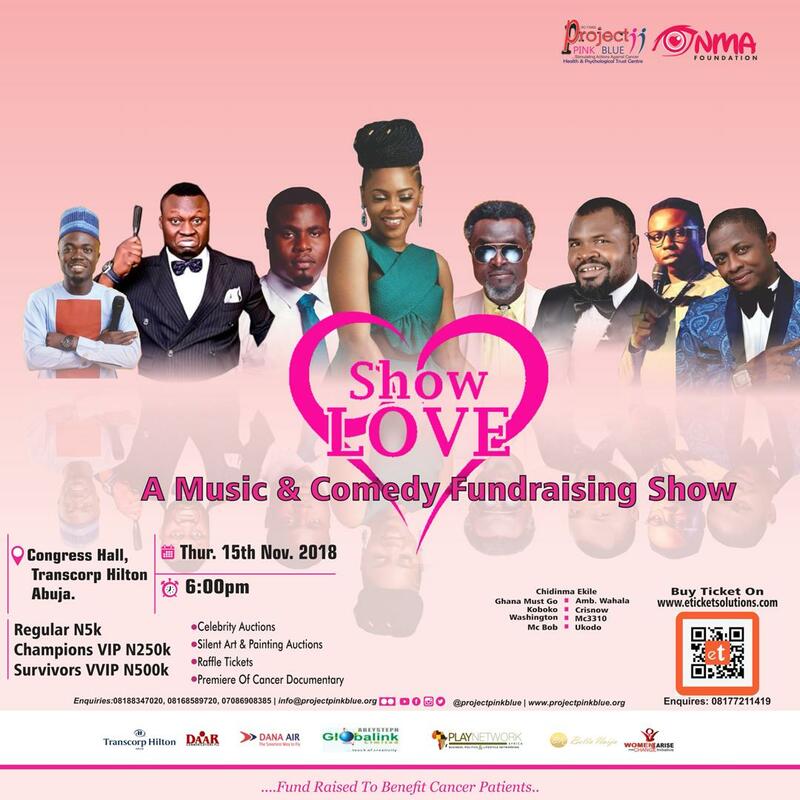 The goal of the music & comedy event is to raise N100million to support the treatment of indigent cancer patients in Nigeria at a fundraising event titled "Show Love" a Music & Comedy Fundraising Show for Cancer Patients. "We can create awareness, provide screenings, oncology education, but, if we don't provide financial support to cancer patients for treatment, then our circle of care is not complete and very few lives can be saved. Financing cancer treatment is very expensive and not affordable for millions of Nigerians. Hence, financial support to indigent cancer patients is extremely important to their survival" said Runcie C.W. Chidebe, Executive Director, Project PINK BLUE and the convened. According to a report on Catastrophic Health Fund for Oncology Care, in Nigeria, a woman needs about N2.1million to N29.2million to treatment breast cancer depending on the type of breast cancer. Because the woman may need about 8 series of diagnosis which may cost between N232,000 to N311,000; she would also need about 3 surgeries which would cost her N670,000 to N3.3million; she would also need chemotherapy for over 10 sessions which may cost about N916,000 to N2.6million depending on the breast cancer and finally, she may also require radiotherapy for 10- 23 sessions, which may cost N138,000 to N360,000. That's for breast cancer treatment in Nigeria. For cervical cancer treatment in Nigeria, a woman needs about N1.1million to N3.3million to treat cancer of the cervix. While for prostate cancer, a man needs about N1.3million to N4.5million to treat cancer of the prostate. With a weak national insurance scheme, very few Nigerians can afford to pay for their cancer treatment in Nigeria. This is one of the reasons for a diagnosis of cancer being likened to be a death sentence. Indigent cancer patients needs our support. Please donate to save cancer patients in Nigeria, said Fatima Abba-Gana, Project Manager, Show Love. The event will be Hosted by: Alex Unusual of Big Brother Naija, music: by Chidinma Ekile, comedy by: Osama, Koboko Master, Ambassador Wahala, Ghana Must Go, MC Tagwaye, MC3310, McBob, Mc Ukodo and many others; dance will feature Adogah Moses & friends- Abuja most energetic dance group. They would also auction some Nigeria celebrities and CEOs to raise funds, such as: Bassey Eyo, CEO, Payporte, the sponsors of Big Brother Naija; Bryan Okwara, former Mr. Nigeria & Nollywood Actor; Charles Okpaleke, CEO, PlayNetwork Africa; Rechael Okonkwo, Nollywood Actress; Laura Ikeji, social media influencer & CEO, Laura Ikeji Store; Kemen of Big Brother Naija and many other CEOs. The Special Guests of Honour are: H.E. Sen. Atiku Abubakar Bagudu, the Executive Governor of Kebbi State; H.E. Dr. Zainab Shinkafi-Bagudu, Wife of the Executive Governor of Kebbi State; H.E. Betty Anyanwu-Akeredolu, Wife of the Executive Governor of Ondo; H.E. DCNS. Omelewa Yetunde Ahmed, Wife of the Executive Governor of Kwara State; H.E. Dr. Amina Abubakar Bello, Wife of the Executive Governor of Niger State; H.E. Dr. Rasheedat Yahaya Bello, Wife of the Executive Governor of Kogi State; Chief Moji Makanjuola, Veteran Broadcast Journalist; Chief Chidinma Uwajumogu, Founder of Egobekee Foundation; and many other influential Nigerians and diplomat community. For donations for cancer patients, please pay to: Health & Psychological Trust Centre, 5600285654, Fidelity Bank Plc. For tickets, please visit: www.eticketsolutions.com . Tickets are also available at Drumstix Restaurant Wuse II, Abuja, Niger Delta Restaurant, City Park, Wuse II, Abuja and at Project PINK BLUE Office, 22 Koforidua Street, Zone 2, Wuse, Abuja. You can also call: 08188347020, 08168589720 or 07086908385 for tickets or enquiries.